Today we cross over the hump where we are closer to autumn than we are to spring. As good as summer is, I very much look forward to shorter days and cooler weather as the season winds down (relax, we have another 45 days of summer to go). 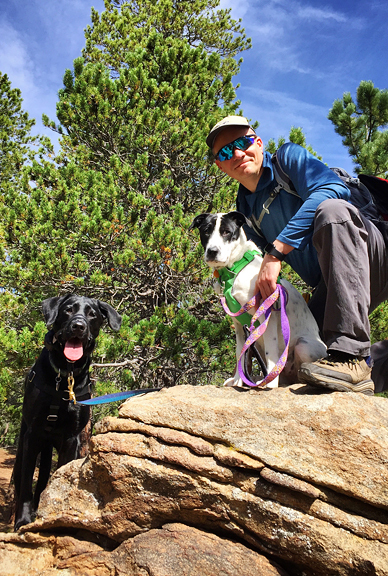 Good things come with the second half of summer, like (more) mushrooms and huckleberries and watching our sweet little Yuki grow up. 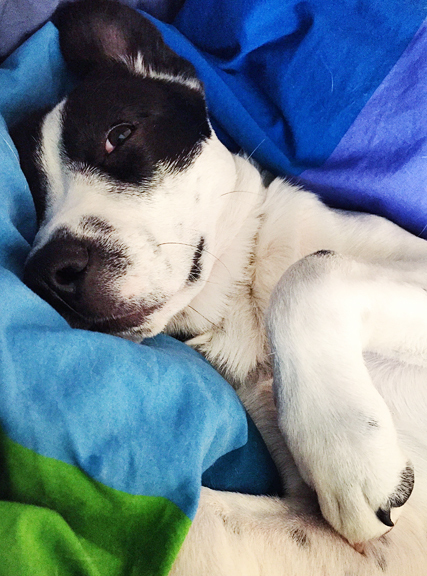 I know what life was like before we got her, but I can’t imagine life without her now. When she first came home, we noticed faint little spots all over her coat and wondered if they would fade or come in. Well, they’re coming in! She looks like an adorable walking pint of chocolate chip ice cream. We recently taught Yuki how to catch. When we first started, the treat would bounce off her nose and she would blink in confusion. We realized that Neva could show her what we meant and from there it went rather quickly as the puppy honed her coordination. It’s times like these that I’m so glad we put the effort and energy into training Neva. She makes a great big sister because she’s never jealous, she always lets the puppy have first dibs, she likes to play, and she executes her tricks on command. We have begun to decipher Yuki’s subtle body language when she wants to go out to potty, when she’s hungry, or when she wants to play. I say subtle because her facial expression rarely changes. Erin calls it Resting Yuki Face and it is the same when she’s tired, when she’s bored, when she’s excited, and when she’s about to jump up and lick your face. It’s ridiculous, really. She brings us all so much joy. 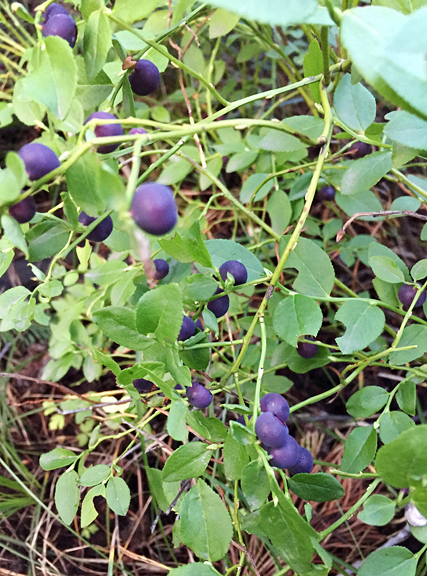 I’ve spent nearly every morning of the past week picking huckleberries among the early morning local wildlife. Last year was a good year for hucks, but this year is better. I’ve already foraged as much as I did in all of 2017 and the big huck patches are still coming online. Anything else this season will be icing on the cake… or pie. 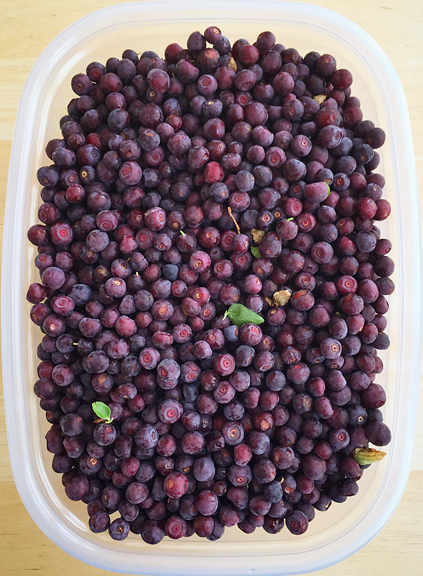 It takes a lot of huckleberries – and hence, time – to make a pie. With everything that’s been going on this summer, I am keeping our menu simple and easy. 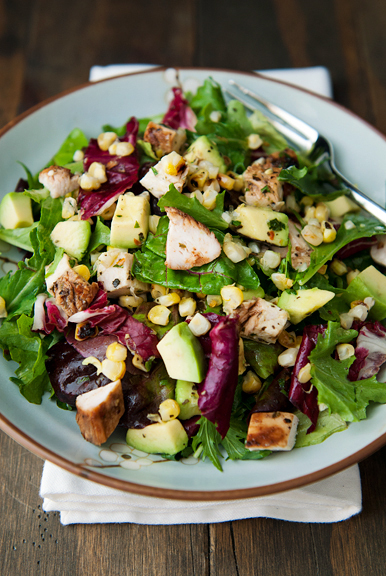 One of the best meals we’ve added last month is a grilled chicken salad. 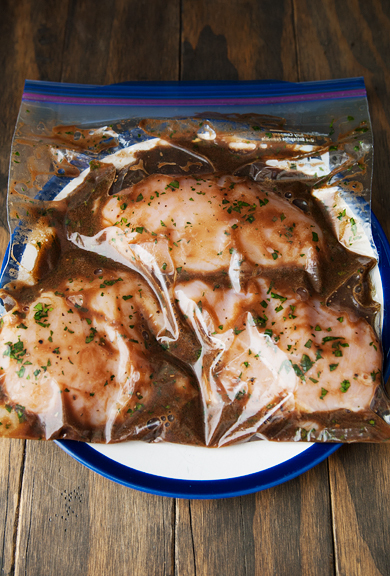 I marinate the chicken, grill it, then keep it in the refrigerator to use as needed over the next 3-4 days. The original recipe included an assortment of dried herbs, but I omitted them because they tasted a little too medicinal for my liking. 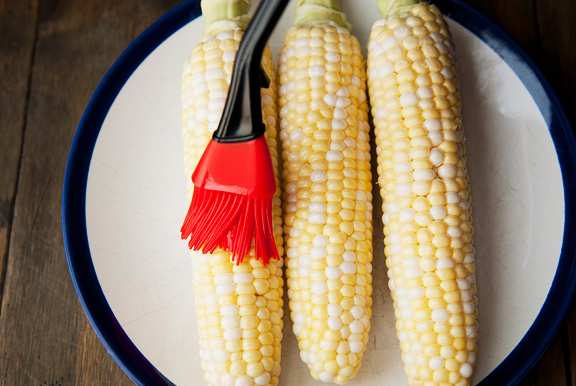 Our local Colorado corn from Olathe has arrived in the markets and we have been enjoying every single sweet kernel of summer goodness on a cob. Before we moved to Colorado over 13 years ago, we had no idea that the corn and the peaches would become such signature components of our summers here. Who knew? Well, now you do! You can boil or steam your corn and cut the kernels off the cobs for your salad, but my favorite way to prepare fresh corn is on the grill. 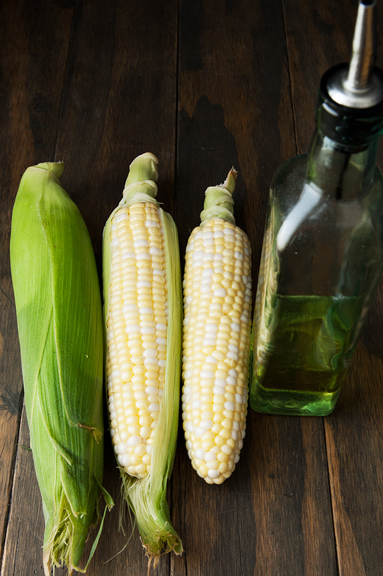 Brush a little vegetable oil over the kernels and grill directly over high heat, turning as the kernels char. This method concentrates the sweetness, adds a little smokiness, and develops a slightly chewy texture. I cook several ears at a time and keep the kernels in the refrigerator to use throughout the week. If you are cooking everything fresh, it comes together in under a half hour. If you have prepped the chicken and the corn ahead of time, it’s more like five minutes to assemble. I like to dice the chicken so we can eat our salads with forks, but you can arrange slices of chicken on your salad to make it more formal. Having a ripe avocado on hand always felt like a magic trick to me, but these days I have some tricks maintain a stash of ripe avocados. 1) I buy a bag of 6 avocados from Costco which are usually hard as a rock. 2) I seal those rock avocados in a brown paper bag with a couple of bananas or oranges and let them sit on the counter at room temperature. The fruit releases ethylene as it ripens which helps the avocados ripen a little faster than they would otherwise – like maybe a day or two faster than if you left them out on the counter. It’s not an instant-ripening method, but I only wait 3 days instead of 5. 3) I check the avocados for some give starting on day 2 because some will inevitably ripen faster than others. 4) If an avocado is ripe or almost ripe and I’m not ready to use it, I put it in the refrigerator which slows the ripening process by a few days. This gives me the biggest window of ripe avocados. As for the dressing, I made an Italian dressing from scratch (seen here) and found it to be rather flat tasting. So instead of giving you that Italian dressing recipe which I probably won’t ever make again, I suggest you use your favorite dressing. 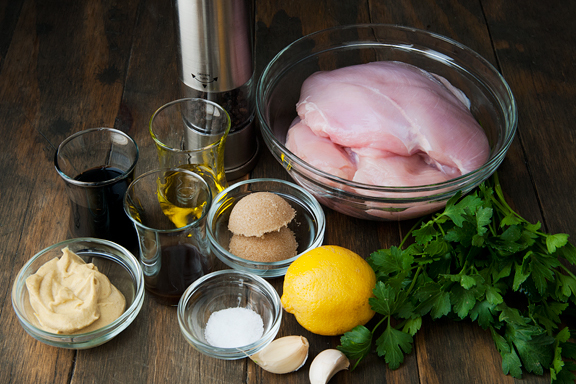 It can be store-bought or homemade, but something with acid (vinegar, lemon) and garlic would work nicely with the chicken. 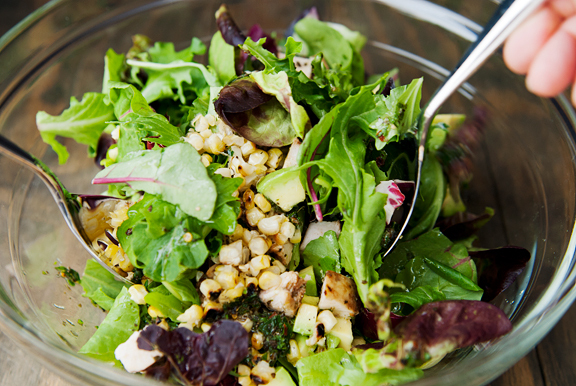 This salad is getting heavy rotation in our summer lunch and dinner menus. It’s quick, easy, and so very satisfying as a meal in itself. And it is by no means a set recipe. Add beets, carrots, radishes, tomatoes, croutons, bacon, or whatever else you like to the mix. That’s what’s so beautiful about salads. This also packs well for lunches at work (keep the dressing separate to avoid wilting the greens), picnics, or potlucks. 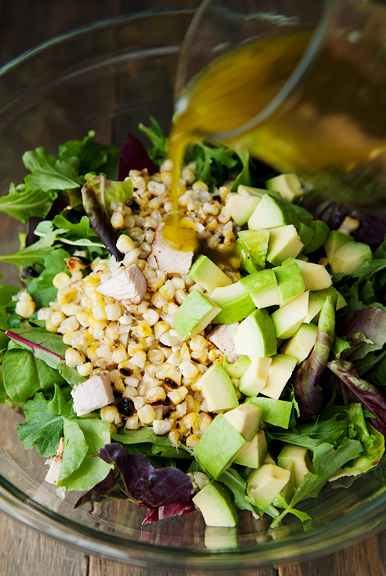 The corn will go out of season before I ever tire of this salad, but there are plenty of other goodies to look forward to as summer comes to a close. 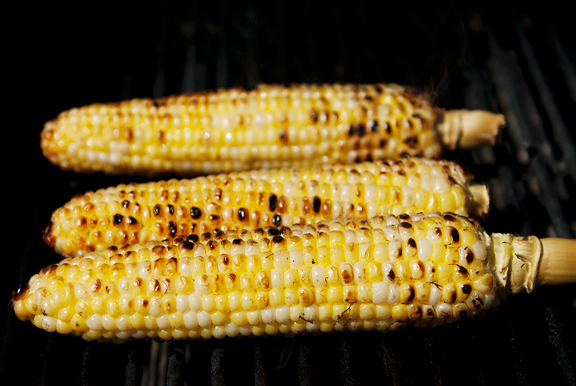 *I like to grill my corn this way: Shuck the corn cobs, brush them all over with vegetable oil. Grill directly over high heat for 2-3 minutes until the kernels begin to blacken. Turn the cobs every 2-3 minutes until the entire cob is slightly charred all over, about 10-12 minutes total. 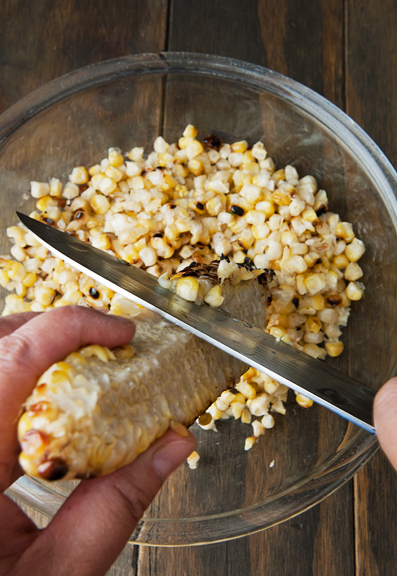 Carefully use a knife to cut the kernels off the cob. 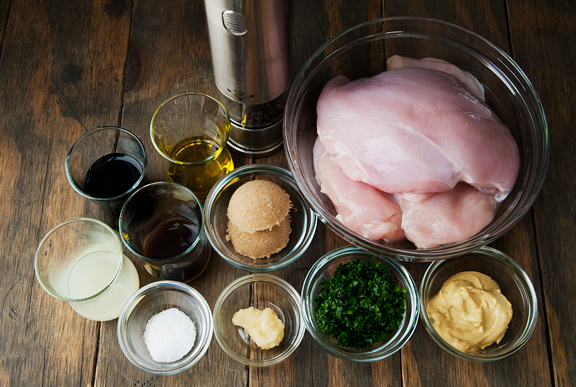 Marinate the chicken: Combine all of the ingredients except the chicken in a large ziploc bag. Push most of the air out and seal the bag. Squeeze everything together until well mixed. Add the chicken the marinade and push out as much air as possible. 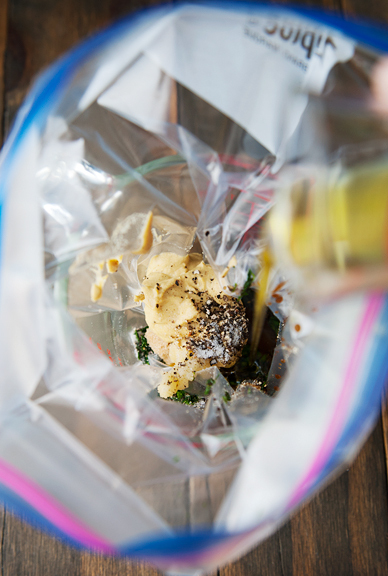 Seal the bag and squish the chicken around in the marinade until evenly distributed. Marinate for 8-24 hours in the refrigerator. 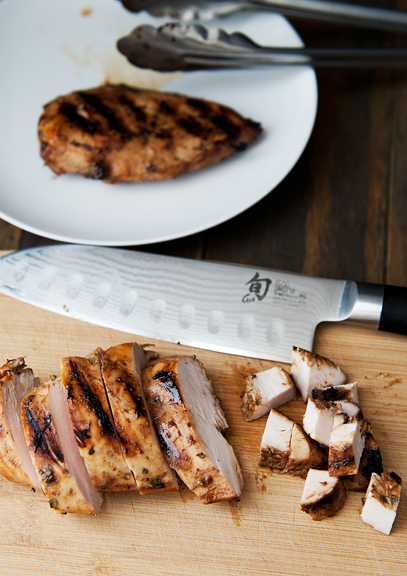 Grill the chicken: Grill the chicken breasts directly over high heat for 3-4 minutes. Flip the chicken and grill another 3-4 minutes. Move the chicken breasts to an area of the grill that gets indirect heat (not over direct heat) by turning off a burner or shoving the coal to one side. 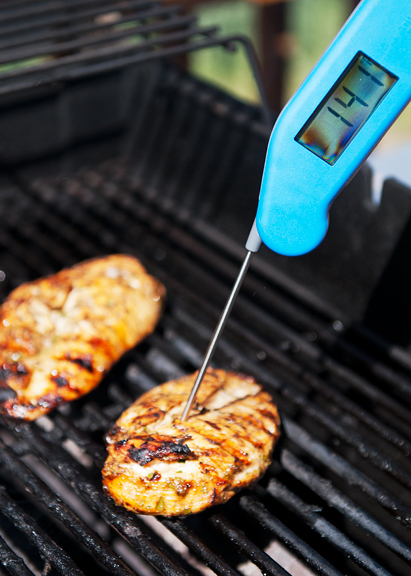 Cover the grill and let the chicken cook until the fattest part of the breasts register 160°F with a meat thermometer. Remove from heat. Slice into cubes. 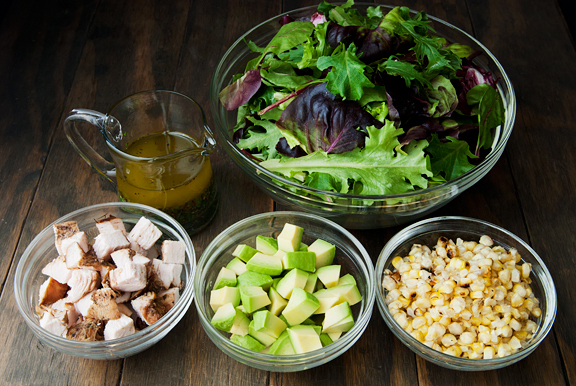 Assemble the salad: Combine the chicken, corn, avocado, salad greens, and half the dressing in a large bowl. Toss to coat. Add more dressing to taste. Serves 4-6. 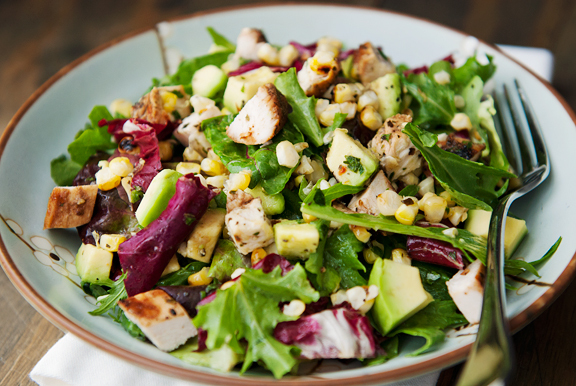 Mmmmm….salad for lunch is my game (I have your delicious balsamic in the fridge right now instead of my usual miso dressing), and this chicken sounds like a lovely addition as I am lacking in lunchtime protein. I adore corn in salads. And of course avocado. Yum! Looking forward to seeing a spotted Yuki!! Yum! Thanks, Jen. And give those pups a hug. So. Darn. Cute. We grill a lot of cor on the cob in PA. Our preferred method is to soak the corn in water for a while before grilling it. It gives it a more Smokey, steamed yet grilled flavor. Melissa – It’s hilarious. Same expression no matter what she’s feeling! jill – Me too! Who would have thought it would be this easy? ?